All canine guests go to spacious, individual exercise areas four times daily. All our inside/outside runs are equipped with sliding door for easy access from the in to out runs. Add a nature walk for an additional $5.00! *Small/Medium dogs are classified as less than 40 pounds. **Large dogs are classified more than 40 pounds. All pets must have current shot information & proof of vaccinations before reservations can be made. Canine must have updated Rabies, DHLPP & Bordetella. Pets are required to have been spayed or neutered. 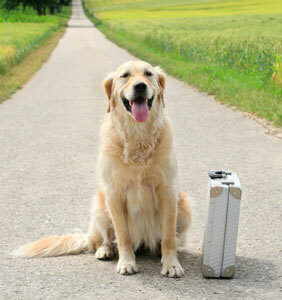 A pre-stay tour/visit for you and your pet is required. We feed premium brown rice and lamb dog food to all our canine guests. You may bring your own food for your pet if you wish. We also accommodate pets with special diets.